SNC’s Dream Chaser in Orbit. Image Credit: Sierra Nevada Corp.
Toronto. September 30, 2014 – Louisville, Colorado’s Sierra Nevada Corporation (SNC) Space Systems has announced a design for an integrated system for human spaceflight that can be launched to low Earth orbit (LEO) using Stratolaunch System’s air launch architecture and a scale version of SNC’s Dream Chaser spacecaft. The announcement was made today at the 65th International Astronautical Congress in Toronto. As designed, the Dream Chaser-Stratolauncher human spaceflight system can carry a crew of three astronauts to LEO destinations. The system can also be tailored for uncrewed space missions, including science missions, light cargo transportation, or suborbital point-to-point transportation. 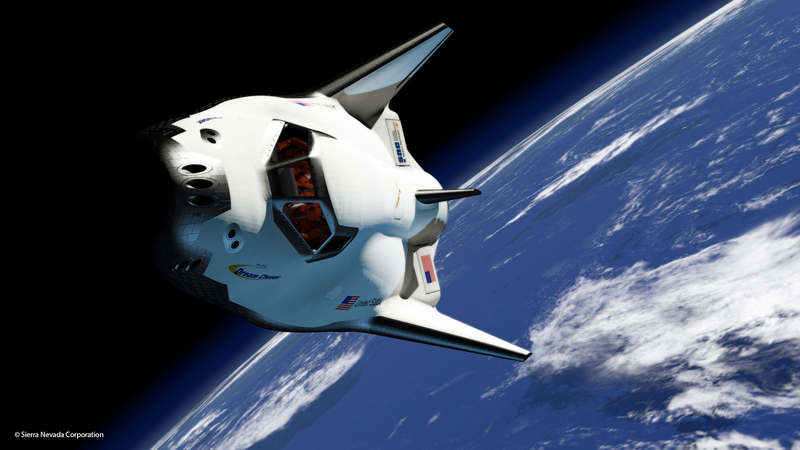 The scaled crewed spacecraft design is based on SNC’s full-scale Dream Chaser vehicle, which can carry up to seven crew and cargo to and from low Earth orbit, including the International Space Station. Stratolaunch Systems is a Paul G. Allen project dedicated to developing an air-launch system. The system is made up of four primary elements: a launch aircraft, a multi-stage booster, a mating and integration system, and an orbital payload. One of the advantages of the Stratolaunch system is the ability to launch up to 1,000 nautical miles away from the primary runway and to loiter in place for up to 1 hour. This ability gives Stratolaunch flexibility to avoid localized adverse weather conditions and to maximize payload delivery. Stratolaunch also has the ability to remain in a launch-ready configuration on the ground for an extended period of time. “This relationship would expand our portfolio to include the highly flexible Stratolaunch system for launching reusable crewed or uncrewed spacecraft, or for rapid satellite constellation deployment,” said Mark Sirangelo, corporate vice president of SNC’s Space System. Don’t expect to see the Dream Chaser-Stratolaunch system flying out of Colorado any time soon though. Actual flight testing of the Stratolaunch is not expected to begin until 2016. The company expects the first launch of a basic space vehicle to occur in 2018, and initial efforts will focus on uncrewed payloads until safety, reliability and operability are demonstrated. Transporting humans on the Dream Chaser vehicle to low Earth orbit via Stratolaunch will be several years away. Once Stratolaunch is complete, it will be the largest aircraft ever constructed, weighing more than 1.3 million pounds and having a wingspan over 380 feet – the same length as a football field. The air-launch system will use six 747 engines and will require a takeoff and landing runway that is approximately 12,500 feet long. There are only two runways in the state of Colorado that could support such a flight: one is the newest runway at Denver International Airport at 16,000 feet and the other is a 13,500-foot runway at the Colorado Springs Airport, which it shares with Petersen Air Force Base. The Front Range Airport, which has two 8,000 foot runways, is still hoping to receive formal licensing to become the state’s first spaceport. So although the Dream Chaser spacecraft is capable of landing at any runway in the world, the Dream Chaser-Stratolaunch derivative will most likely be launched from one of the sites that Stratolaunch is already considering, which includes Kennedy Space Center in Florida, Wallops Island in Virginia, or Vandenberg AFB in California. Another disadvantage for Colorado is that although the full-scale Dream Chaser has been designed to launch vertically on a United Launch Alliance (ULA) Atlas V launch vehicle, Stratolaunch has partnered with Orbital Sciences Corporation of Virginia for the design and development of its air launch rocket system. Orbital develops and manufactures small- and medium-class rockets and will be responsible for the program’s overall systems engineering, as well as development, production, integration, test and operations of the air launch vehicle and its related support systems. Sirangelo said that they’re not yet ready to discuss the propulsion system that would be used on the scaled-down Dream Chaser. Dream Chaser has undergone development and flight tests for the past four years as part of NASA’s Commercial Crew Transportation Capability Program (CCtCap). On September 16, NASA announced that it would be splitting the $6.8 billion contract between Boeing and SpaceX and that Sierra Nevada Corp. would not receive a contract. SNC filed a formal protest with the U.S. Government Accountability Office on September 26, stating that the U.S. government would spend up to $900 million more at the publicly contracted level for a space program equivalent to the program that SNC proposed. Since the contract announcement, SNC has laid-off nearly 100 of its employees.